, any of an important class of extremely reactive chemical compounds used in the synthesis of hydrocarbons, alcohols, carboxylic acids, and other compounds. ..... Click the link for more information. allows the hydrolysis of proteins, fats, oils, and carbohydrates. an ion-exchange reaction between various substances and water. In general, hydrolysis is represented by the equation A—B + H—OH ⇄ A—H + B—OH, where A—B is the substance undergoing hydrolysis, and A—H and B—OH are the products of hydrolysis. In hydrolysis of salts, equilibrium is governed by the law of mass action. If insoluble or readily volatile substances are formed by hydrolysis, there is virtually complete decomposition of the initial salt. In other cases, the weaker the acid or base of the salt, the more complete the hydrolysis. The degree of hydrolysis (α) can be used as a quantitative characteristic for the hydrolysis of salts. It is equal to the ratio of the concentration of the hydrolyzed part of the molecules to the total concentration of the particular salt in solution, and in most cases it is small. Thus, with 0.1-molar solutions of sodium acetate, CH3COONa, or ammonium chloride, NH4Cl, at 25° C, α = 0.01 percent, whereas for ammonium acetate, CH3COONH4, α = 0.5 percent. The degree of hydrolysis increases with an increase in temperature and with dilution. The hydrolysis of salts forms the basis of many important processes in the chemical industry and laboratory practice. The partial hydrolysis of tricalcium silicate causes separation of lime during the reaction of portland cement with water. Buffer systems, which are able to maintain constant acidity in a medium, exist because of hydrolysis. Buffer solutions are also very important physiologically, since a constant H+ion concentration is necessary for normal body activity. A number of geological changes in the earth’s crust and the formation of minerals, natural waters, and soils are associated with hydrolysis. R—Hal + HO → R—OH + Hal-SN2. 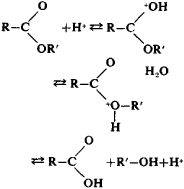 The hydrolysis of ester, glucoside (in carbohydrates), and amide (in proteins) bonds plays an important part in the vital activities of all organisms—that is, in processes such as the assimilation of food and the transmission of nerve impulses. In the living organism, hydrolysis is catalyzed by enzymes (hydrolases). Kireev, V. A. Kurs fizicheskoi khimii, 2nd ed. Moscow, 1956. Reutov, O. A. Teoreticheskie problemy organicheskoi khimii.2nd ed. Moscow, 1964. Decomposition or alteration of a chemical substance by water. In aqueous solutions of electrolytes, the reactions of cations with water to produce a weak base or of anions to produce a weak acid.